Inequality is now a major dividing line in the world of public policy. Supporters of limited government think it’s not a big issue and instead focus on the policies that are most likely to generate growth. Simply stated, they tend not to care if some people get richer faster than other people get richer (assuming, of course, that income is honestly earned and not the result of cronyism). I sometimes wonder how vigorously to present my argument. Is it actually true, as Thatcher and Churchill argued, that leftists are willing to hurt poor people if that’s what is necessary to hurt rich people by a greater amount? But, after reading a new study from the International Monetary Fund, I’m wondering if I’m underestimating the left’s fixation with inequality and the amount of economic damage they’re willing to inflict to achiever greater equality of outcomes. And, as you continue reading, it should become obvious that the bureaucrats are pushing a very radical agenda (not that we should be surprised given the IMF’s track record). Another use of this data is that it allows the IMF to create dodgy data on income (sort of like what the OECD does with poverty numbers). P.S. 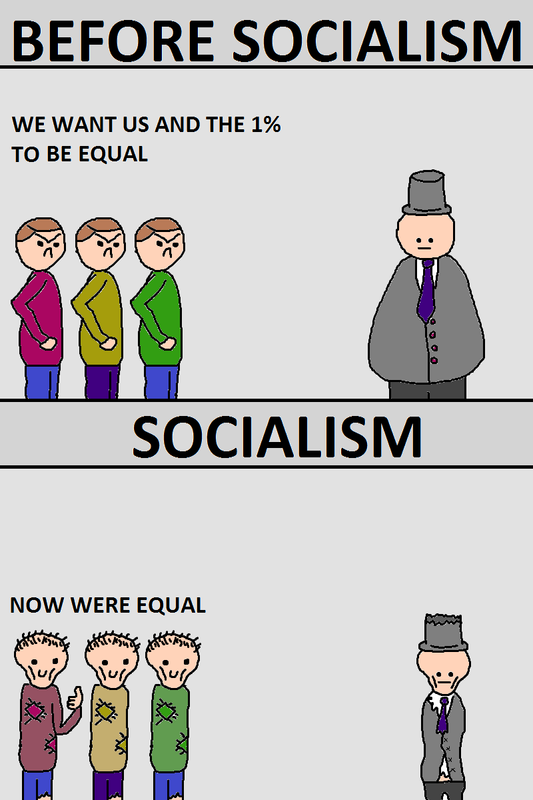 Fans of satire may appreciate this “modest proposal” to reduce inequality. I imagine the IMF would approve so long as certain rich people are excluded. on April 21, 2018 at 9:30 am Genuine Free Markets Easily Out-Perform “State-Led Capitalism"
These little tyrants at the IMF are willing to tolerate 60% “leakage” in redistribution because much of that is their own salaries and benefits for doing the hard work of taking resources from some to give to others. We could have heard the same discussion concerning Al Capone’s protection rackets in 1930’s Chicago. How much can we take from businesses whithout hurting our own take? The word “redistribution” is fundamentally wrong. Incomes are not distributed by the government to begin with. Bureaucrats are not appointed by God to correct inequalities of intelligence, work ethic, athletic ability, or beauty. Of course, government bureaucrats may see distribution and redistribution as natural because they live in a political world of favors and distribution. Redistribution may seem to be good within that foul system. I am all in favour of this as long as we start by taxing the bureaucracy that thought of it all so that we can see the effects before we impose this on everyone. I suspect like most bureaucracies, they really mean everyone else while they remain the better off “ruling class”. they are not out there creating wealth just redistributing it. After all, creating wealth means taking risks and we cant have that can we? I think we have an ethical obligation to look after those who are unable to look after themselves, ill, disabled, elderly but everyone else should contribute something. Even those on unemployment benefits should be contributing something back whether it is as park cleaners or volunteers etc. But can we please not deliberately go backwards. Can we continue to ignore the evidence that capitalism , while it has faults, has removed more people from poverty in the history of the world than ever in human history. I don’t think the left is completely out of its mind on this. We do judge things on a relative scale after all. Where that not the case all humanity would be jubilant right now since the standard of living of even the poorest is much better than the standard of living of 99.9% of all humans who ever walked on this earth. So I am not surprised that for a lot of people equality enhances their perceived standard of living. The problem is that the exact same argument also works in reverse. If the effort reward curve is flattened and thus growth is slowed down, because of the compounding and exponential nature of growth, our children and grandchildren will be multiple times poorer than they would otherwise be if we follow socialism. A lot of it has to do with the population’s general inability to comprehend and compute elementary exponents. The future contains wonderful and unimaginable to us things today — and that will become ever more true as time goes by and growth not only continues but actually accelerates. But it is hard to comprehend and to accept what is unimaginable to us today. PS. The IMF did not used to be that way. It has become ever more so in the past couple of decades, as it has become dominated by slow growth European country representatives who are trying to slow down the rest of the world so that the slow growth decline of Europe may not be as conspicuous. PPS. The IMF can and will do a lot of damage, but it is ultimately fighting a futile war. The genie of high growth is out of the bottle. The IMF will not be successful in rounding up the whole world into a slow growth pattern. A few countries will escape and form the new branch of human success. The goal of every American should be to make sure that the United States does not end up in the IMF group of decline. However, the numbers and probabilities being what they are, I’d suggest to most people that they stay open minded and mobile. It is possible that traditional arguments against redistribution are no longer true. Lower income levels have been negative or flat, while upper levels have been doing quite well, in a period of modest growth. In a globalized AI market, those with technological skills or asset ownership will continue to do far better than those dependent on unskilled labor. As we have seen with the recent tax plans, recommended changes fall far short of keeping a vocal middle class happy, since cuts to tax rates benefit those who pay taxes. While we don’t want redistribution to damage incentives to work, neither do we want to grow the redistribution bureaucracy. A federal poverty level UBI would eliminate the nanny state bureaucracy, while not damaging incentives as much as the current system. Eliminating all “tax expenditures” that normally are used by the wealthy and using those funds for a UBI as part of a tax code that benefits lower and middle income earners, we could have far more support for a flat tax that would simplify filing for everyone.